I went to Sinai with my friend Mary. She has given me books across the years of our friendship and this journey started with my reading her Christmas gift of The Sisters of Sinai by Janet Soskice (you can hear her talk about them by clicking the link.) 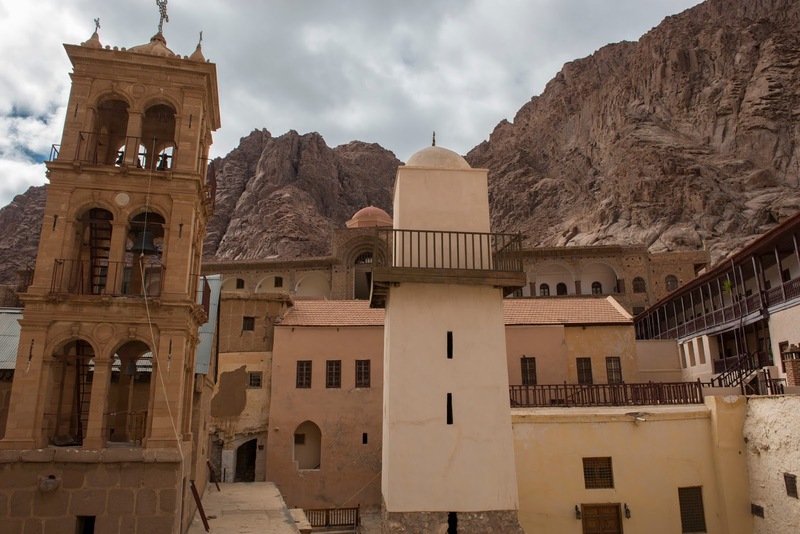 These two sisters and their journey to discover what really was written in ancient manuscripts stored at St Catherine’s Monastery and their connection with the Monks was our starting point. My friend Mary has always inspired me because she has a stillness about her and as an artist has a discerning eye. I am the one of this friendship who can’t resist taking action and having read the book and found a journey going to Sinai led by Sara Maitland (click for info), I persuaded her that we could do it, we could camp in the desert for a few days not realising we would really be out in the middle of the sandy desert with no tent, just ourselves in a sleeping bag and the stars above us, no loo, no electric rollers, no radio, no i phone, just 12 people scattered over the desert gazing upwards and watching the light of the sun and moon changing our days into nights and our nights into days. As we woke, we would see others sitting up in their bags, getting dressed in the bag, clambering out and walking across to the one tented structure which contained the hole in the ground which if we had been American, we would have miscalled the bathroom. We were a long way away from England, from Sainsburys and what we thought of as our lives! And we finished our time there by visiting St Catherine’s Monastery which is where the next part of my adventure began. This was where hermits and ascetics travelled from the earliest days of Christianity to be at the foot of Mount Sinai where so many old and new testament stories meet and where since the 4th Century there has been a fortified Monastery which over the centuries has filled and emptied with Monks according to the desire of men to renounce the world and which has the most exquisite collection of icons and manuscripts. At this time, there are perhaps 29 monks attached to the Monastery, some very old but interest in it has increased as the realisation of the threat to religious freedom has risen and polarisation and misunderstanding has threatened so many buildings and communities. In an age where we preach liberalism in so many parts of life, true freedom to worship has been reduced to a point where instead of enjoying the diversity of ways to approach and pray to God through the pathway we have chosen, people feel threatened by the ways of others leading to extreme thinking that ‘my faith is The One faith and No other should exist’. Here at the Monastery, while following with devotion and absolute adherence to their own programme of worship, pilgrims and visitors just interested in the history of the Monastery are welcomed. Here is where I knew I wanted to return, to return over and over again, not just to stare and wonder at the treasures, but to simply be there, attending or not, the services I was allowed to go to, sitting in front of the icons, not understanding or knowing enough to translate anything into my own language but to allow the place and the feel to enter my heart. And so growing to love the place, being of an active nature, I wanted others to know about it and to take it to their heart so that it would continue to be protected. This year, Father Justin, an unusual Monk given that while he is a Greek Orthodox Monk, he is a most erudite and intellectually sharp Texan born, quietly spoken man. He is coming to England and YOU can meet him too. He will be here on November 28th, speaking at St Martin-in-the-fields in the morning and at Mandeville Place in the evening. You can read about all this and register for both events by clicking this link to the newsletter with all the details. If you never get to camp in the Sinai desert and you never manage to come with me to St Catherine’s Monastery, then register now to hear Father Justin and book your ticket to London from wherever you are. This is an opportunity not to miss.